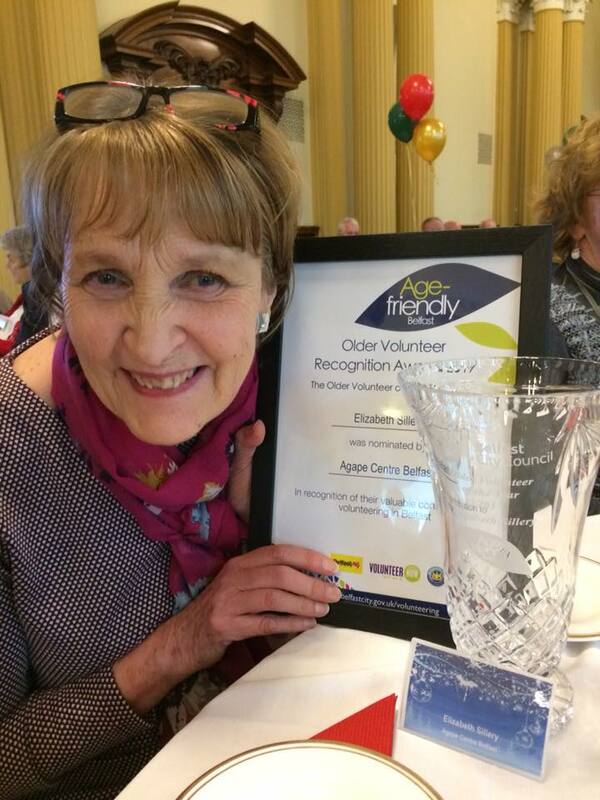 Earlier this year one of the Agápē Centre volunteers Elizabeth Sillery was nominated for the Belfast City Council “Age Friendly Volunteer Awards” which are held every year. The awards have been running for five years, and aim to recognise the unsung heroes who volunteer across Belfast, who dedicate their time within the charitable and voluntary sectors. For many years, Elizabeth has long been a stalwart of University Road and more recently Belfast South Methodist Church, and since it’s inception five years ago she has been heavily involved in the work of the Agápē Centre. Her commitment and dedication to the Centre has enabled other voluntary and private sector organisations to use the Centre for meetings, interviews, group work, training, sports and team activities. A smile is always present and a willingness to go the extra mile to ensure guests are well looked after. She is a perfectionist, and her sandwiches are step above all others!! Yesterday at a wonderful lunch and awards presentation, Elizabeth along with Andrea and Jo-Anne went to Belfast City Hall. The atmosphere was lovely as the Christmas tree took centre stage in the foyer, so we grabbed a few pictures before being welcomed into the Great Hall. All the nominees were present for each of the five categories. Elizabeth had been nominated for the Age Friendly Volunteer Category. There was a long list of nominations from various organisations across Belfast, and it was with great delight that Elizabeth was selected as the overall winner. I’m sure everyone will join us in celebrating this wonderful achievement for Elizabeth and pass on their Congratulations.